click image for close-up For Africans destined to be slaves in the New World, a long march lasting several months was not uncommon. This 19th century engraving by an unknown artist shows captives being driven by black slave traders. European slave traders in Africa did not seize land from natives and colonize the coast, as they did in their New World settlements. Instead, they established a special relationship with local chieftains, who allowed them to maintain trading forts along the coast. 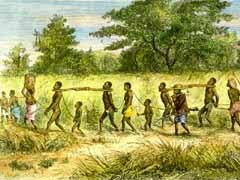 Local Africans, rather than the Europeans themselves, acquired and supplied slaves to the white traders.